Cat's Best Öko Plus is up to 3 times more efficient than conventional clumping cat litter because the natural plant fibre capillary system is very effective in retaining fluids. Cat's Best Öko Plus can be used more sparingly and is therefore more economical than many other types of cat litter. Cleaning and refilling the litter box is reduced to a minimum because Cat's Best Öko Plus stays in the litter box longer- thanks to its ability to trap odours and remain fresh-smelling. Traps odours extremely well Has a pleasant, natural smell – no artificial additives Can be composted and is 100% biodegradable: Cat's Best Öko Plus is currently the only cat litter that can be composted and is biodegradable. Therefore you can empty the litter box right onto the compost or into the garden waste bin. (Please check with your local refuse company). The soiled clumps, which should be removed daily, can be flushed down the toilet. 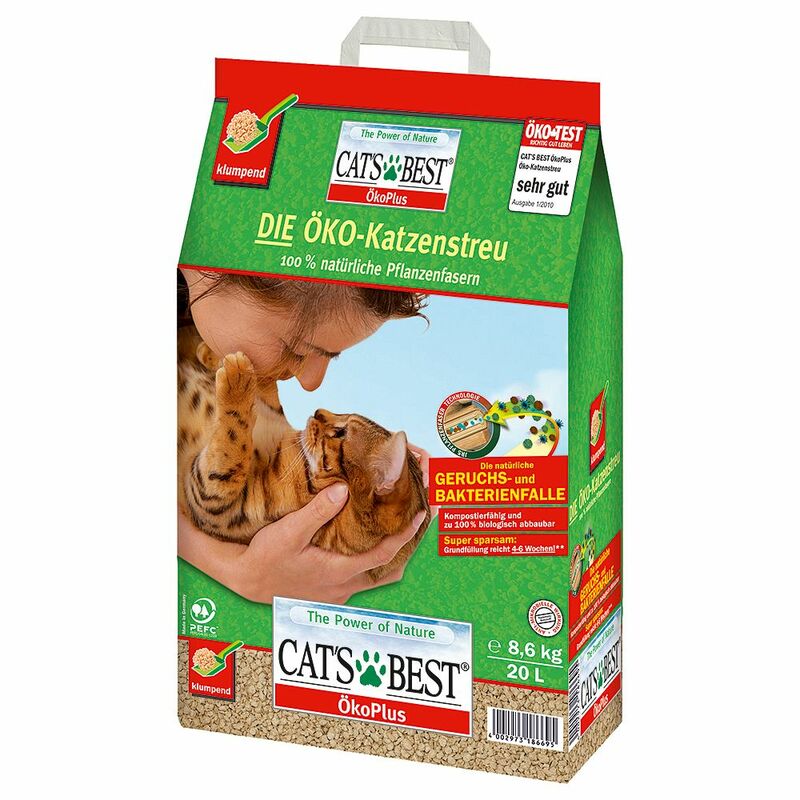 100% pure plant fibres: Cat's Best Öko Plus is a woodbased cat litter, made from the finest plant fibres from untreated native fir and pine timber. This timber is readily available and the felling of such trees helps to promote healthy, natural forests. Up to 3 times more efficient than conventional clumping litter Up to 700% moisture absorption compared to original volume Easier to transport Can be flushed down the toilet: Cat's Best Öko Plus is made from natural plant fibres, which diΒolve in water, just as toilet paper does. It will not cause pipe blockages or impact negatively on sewage treatment. Please flush using plenty of water. Gentle on your cat's paws User instructions: Clumps should be deposited in the toilet one by one and given plenty of time to individually diΒolve before flushing. Disposal can be made even easier by lightly crushing clumps with a litter scoop to make them smaller. Only one clump should be deposited in the toilet at a time. Allowing the water to fully diΒolve the clumps will ensure that the proceΒ is simple, clean and hygienic. Using the household toilet is not recommended for the disposal of an entire tray of cat litter. In this case, please refer to your local waste disposal regulations - organic waste, compost or normal household waste! Return to Cat's Best cat litter overview. Cat's Best Öko Plus is available in the following sizes: 10l, 20l, 30l (10lplus20l) and 40l exclusive to zooplus!. Price just £12.99! Click here to buy now!